On the first day of the Spring 2015 semester, I was nervous. I sat in my office in Simpkins Hall with fluttering butterflies running amok in my stomach, dreading the moment I would have to go teach my new section of Freshman Composition. Would I have hardworking students this semester? Would they absolutely hate the planned ice breaker? Would they like me? Would I like them? Question after question ran through my mind until something strange happened. There was some sort of shift in my mind and I suddenly felt calm. I remembered that I am, in fact, qualified to teach and, not only that, but I have experience in teaching this subject. This calm feeling ran through me, and I innately knew that everything was going to be okay. And if it wasn’t okay, then that would be okay, too. Listening to my “Get Psyched” playlist – which contains a lot of the Beatles, Journey, and the Who – I felt far more prepared than I thought I would be. “I’ve totally got this,” I thought, and waltzed into my classroom – that’s right, my classroom – and took charge. For the first time since I started this teaching business, I felt like I wasn’t pretending to be something I wasn’t. I was ready. There are few things scarier than teaching your first class. 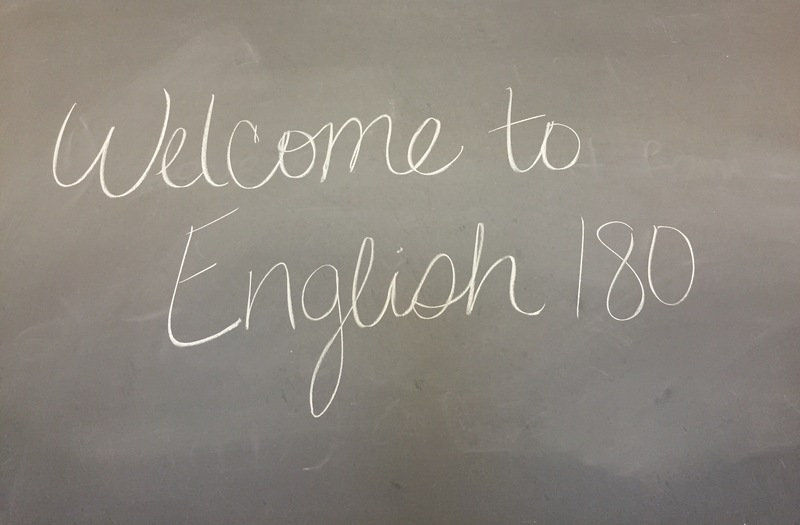 Last semester, as a newly indoctrinated Graduate Teaching Assistant entering her first English 180 classroom, I was a nervous wreck. I spoke too fast, made lame jokes no one understood (doing my best Ben Stein impression: “Bueller? Bueller?”), and let my 75 minute class out after a mere 20 minutes. It was kind of a disaster. This semester, however, things started differently. That awkward, uneasy person isn’t really that uncomfortable in front a classroom anymore. Don’t get me wrong – I’m still very much that person, but something has changed now that I’m teaching my second semester of English 180. I’m more confident and I don’t let things get me down like I used to. I’m not sure, but I’m inclined to think that it is. Teaching is a weird thing, for me anyway. It’s never stable. There are good days, when students are engaged and responding wonderfully to a well-thought out lesson plan. Then there are bad days, when no one did the reading and I lecture to 22 blank, uninterested faces. It’s generally a tossup. Even so, the differences between the fall and spring semesters are remarkable. I don’t stress out nearly as much as I used to about whether or not my students will like me, if they do the assigned readings, or if they listen to anything I say. I’ve realized that while I am their teacher, it is not my responsibility to worry about their own work for them. I’m here if they need me, but I’m not going to stress if they don’t utilize my office hours or email me with questions. I do my part and it’s up to them to do theirs. This semester has been pretty great so far, and I think a big part of that – in addition to my amazingly bright students – is the poise I’ve developed in the classroom. Not to say that I’m not this goofy, nerdy person – because, believe me, I still am – but I’ve learned to accept that part of my persona. I think my students gravitate towards it because I’m not pretending to be someone that I’m not, and I’m very grateful that I learned that after teaching my first semester.